Potion making is an essential skill for young and novice witches. It is basically learning to cook and mix cocktails. The difference is that, as witches, we must be mindful of the medicinal and magickal properties of ingredients, and boost their effectiveness with ceremonial and ritual practices. Not all potions are meant to be imbibed. Some are magickal liquids that are made so because for some reasons a liquid would be the best transmitter for the energy. First though, let’s talk about the drinkable ones. 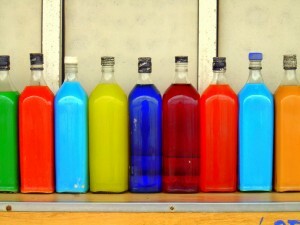 Alcohol based potions are basically prepared alcoholic beverages or tinctures that are meant to be added to beverages. The alcohol increases their shelf life, or may be a magickal ingredient itself. Many deities as well as the Ancestors have their favorite liquor, so adding a specific kind may speak to different energies in the drinker. Vinegar based potions are usually for healing and/or strengthening. They are taken as a medicine by the teaspoon, or added to another beverage. Its magickal properties depend on what it is made of. Regardless of what it is made of though, one of the universal properties of all vinegars is transformation. So it is good to bring change or to guide someone through a change. Much like alcohol, vinegar has a long shelf life, which is one reason there are so many vinegar based potions. Whey based potions are mainly used for strengthening and things that have to do with rebuilding and repairing. Whey is the byproduct of cheese making. It’s the liquid that is left once you curdle the milk and take out the curds. It’s full of protein, and some find it tasty as a drink. Opinions vary on this. Whey has a sort of nurturing property, like milk, but it has more transformative energy since it is made by fermentation. Whey and milk give a somewhat obvious mothering, caring vibration to potions, which is one reason it is best to get it from well treated animals. Many spiritually sensitive people can taste when the cruelty line has been crossed in milk products. Tainted milk has a dog-spit like aftertaste. Overly industrial farming may be one reason that whey potions are less popular these days. The good news is that there is a vegan alternative, the byproduct of vegan nut “cheese” making. You make a sort of acidic solution by fermenting wheat, rye, or other sprouted grains in water, take the spouts out, mix this with nut puree, and strain out the liquid through cheesecloth. You can see an example of this on Rawmazing. To get a similar nurturing vibration in vegan milks and wheys as you do with the animal based ones, you will need to add the step of consecrating the ingredient to your Gate Keeper and Motherhood/Breastfeeding deities. 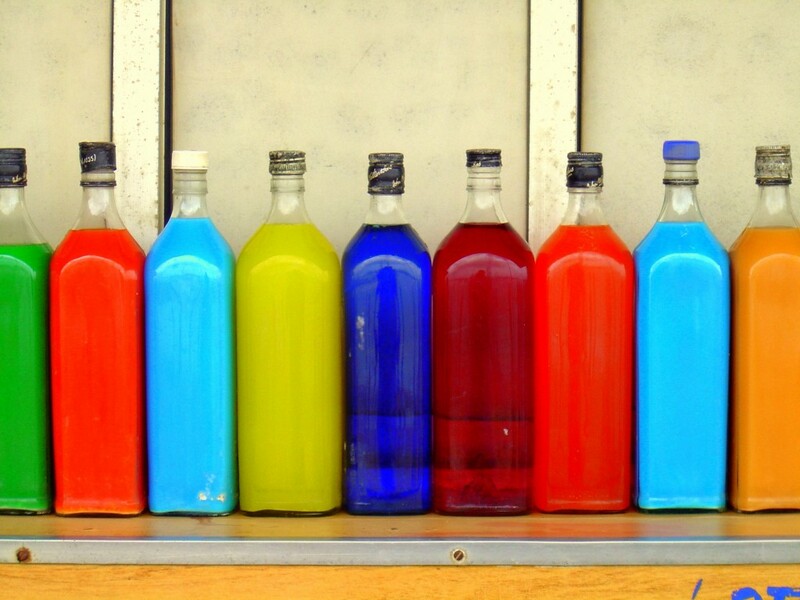 Sugar and syrup based potions are generally used for love, prosperity, and other joy bringing purposes. They are also an alternative to alcohol based potions for those who have problems with alcohol. Different syrups have different magical properties. So don’t always go for simple syrup or honey. Look around at the benefits of molasses, silan (date syrup), agave, and others. Syrups also have a pretty long shelf life so long as you make sure to use proper canning proportions and procedures. Water based potions are basically teas or vibrationally infused waters. Water itself is a life sustaining substance. Consider it something like the breast milk of the Earth. Dissolving powders and capsules are solid bases for potions. “Just add water”. These are often easier to store, or when necessary, to conceal. It is a good idea to have a stock of certain powder mixes ready when needed. Cold and flu herbal mixes and teas spring to mind, as well as preparations to help people get through recurring problems like PMS/PMT and the “male period” or ebbs and surges in testosterone. The recipes vary, but there are a few standard rules. These are very similar to the rules for canning or cooking for others. There is a reason the witches’ cauldron is an old standard. Nowadays people treat them like glorified incense burners, but their original purpose is cooking and making concoctions. You don’t necessarily have to have the famous iron cauldron, but you should have pots and cooking equipment suitable for the things you want to make. 2. Clean your workspace and equipment. If something is to be stored long term, then all of the equipment and containers should be as sterile as possible. For things to be refrigerated, frozen, or used immediately, one does not need to overdo it, but you should still be relatively clean. Some deities have special cleaning instructions. You want to be mindful of this when you want their energy to abide in something. Some like their ritual items cleaned with a certain kind of wine or liquor. Some, various herbal infusions. Follow the traditional or revealed standards, and if you aren’t sure, ask an elder or do divination. 3. Remember food safety standards. You should be as conscious as anyone would who was canning home made jams for sale or inviting friends for dinner. Be very mindful of allergies. If you’re not sure how someone will react to an ingredient, do a test of a small amount first. If they have a bad reaction to it, don’t continue. You don’t want to make someone sick. An old test to see if something is poison to someone, is to dab a little bit in their armpit and wait a day. If it makes a rash, then that person is allergic or sensitive to it. 4. Open the gates properly beforehand. If you have a Gate Keeper deity, they should be petitioned and satisfied before beginning a potion or any other magickal project for that matter. You should be or get on good terms with all deities or forces of Nature who are relevant to a working. Take care of these things before you start. Also be aware of the cycle of the week, seasons, and year. Some things work better at different times than others. 5. Be mindful along the way. Don’t just throw ingredients together and expect them to work. Add ingredients mindfully. Chanting helps. Every plant, stone, and animal has Parent deities who appreciate reverence when their children are utilized in spells and magickal workings. 6. Unless there is some reason not to, make sure to close and clean well. Close ceremonies properly, and make sure to clean up after making potions. Not everything is good to spread around, and you may not want “leakage” from one working to the next, especially when making potions for individual cases. So clean and purify things when you are done. If you have any questions, feel free to ask in the forums. elixir, elixirs, how to make an elixir, how to make potions, how to make witches potions, magic potion, magick potion, making elixers, making potions, potion making, potions, potions witchcraft, witch potion, witchcraft potions, witches potion. Bookmark. So… A whey base would be good for a healing potion?… Granted that the animal is treated well, of course. Yes, whey and other milk products are great for healing and protection because they are the physical manifestation of mother’s love. It is best when it comes from someone who is happy and well treated. Cow’s milk is iffy in some places, so before using it for magical purposes, taste a bit and see if it has a weird dog dander-ish aftertaste. Female pregnancy and nursing hormones should produce a sort of almondy, maybe slightly chlorine and onions type of aftertaste or odor. We are not so far from other mammals. If the milk smells or tastes unnatural or like it has too much of something, that was not from a well enough treated being.